HRD Coffee Shop is a restaurant in San Francisco that was featured on Diners, Drive-ins, and Dives. You wouldn’t know it from the name, but HRD Coffee Shop actually specializes in Korean food with some American diner influences. I came here with my Mom for lunch and the place was packed. We had to wait in line for about 15 minutes, but they move the line pretty fast. The inside of the restaurant has a dumpy diner atmosphere and it is more of a place to come and eat than to sit around and enjoy the ambiance. My Mom originally wanted a noodle dish, but they were sold out of noodles. She then asked for one of their torta sandwiches, but they were also sold out of bread. It was pretty ridiculous that they were sold out of half of the items on the menu and they could have at least put up a sign warning people since there was a line up out the door. She ended up with the beef short rib bibimbap bowl, which I was secretly happy she ordered because it was an item I was deciding between. The short ribs were flavourful, but quite chewy and hard to cut. I ordered the spicy pork bibimbap bowl and I loved it. It was one of the best bibimbap meals I’ve had. 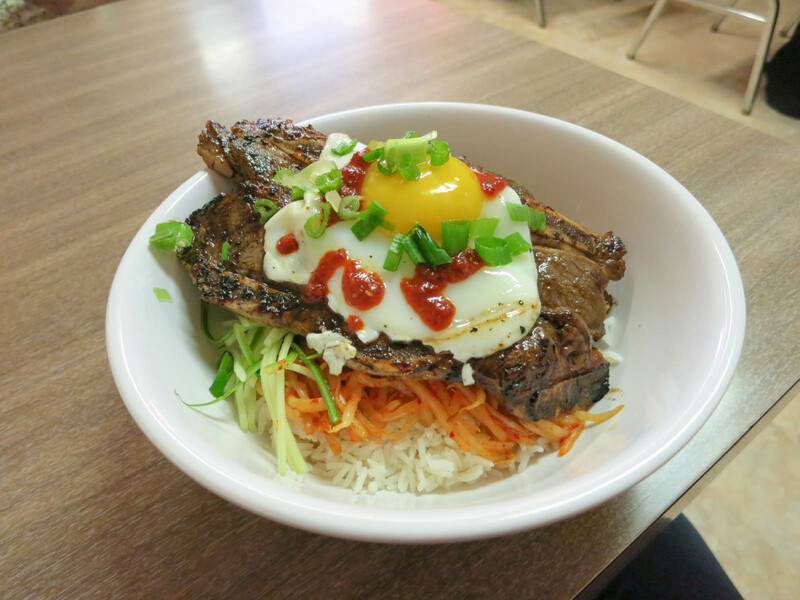 It was filled with marinated bean sprouts, kimchi, green onions, thinly sliced carrots and cucumbers, and a fried egg. The pork was flavourful and tender and it had some spice to it. I normally don’t like bean sprouts, but the ones they used were very good. I’m not sure what they marinade them in, but they were great. Their kimchi was also excellent here. I’m picky about the kimchi I like and sometimes I find it too sour. Their kimchi was sliced up into bite sized pieces and it was pretty spicy, which I liked. My meal was very filling and I couldn’t even finish it all. The whole bowl had a wonderful spicy flavour and all of the veggies were crunchy and fresh. This is a good place for a filling, flavourful, and affordable meal, but don’t expect great or reliable service. 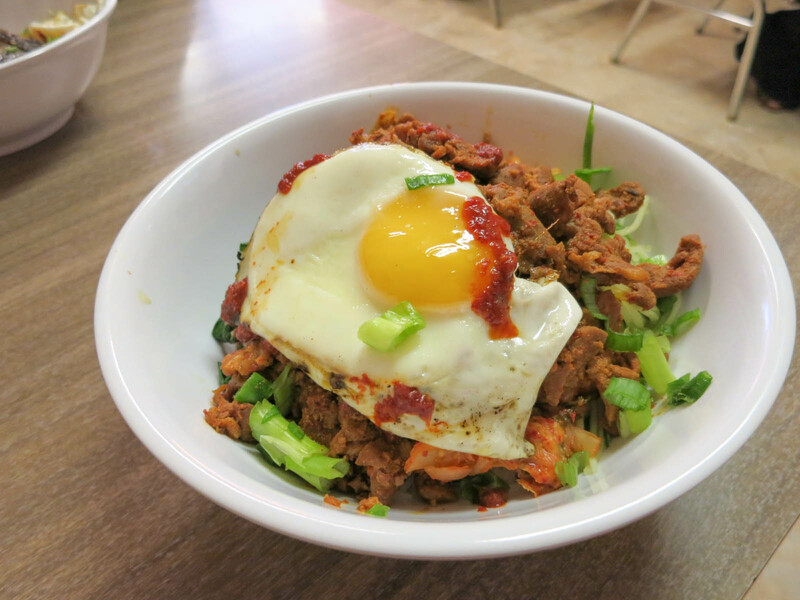 Yes, the spicy pork bibimbap is great.